Fredericksburg weather might be delightful now, but temperatures will soon dip mid-Atlantic cold snaps will set in. That’s right—winter is coming, and there’s nothing you can do about it. You might not be ready for the cold yet, and that’s okay—but your home should be. From the Fredericksburg HVAC professionals to you, here’s a to-do list of tasks to complete so your home is ready for the winter months ahead. Don’t put these tasks off until November when rain and snow are spewing from the sky—the time to act is now! 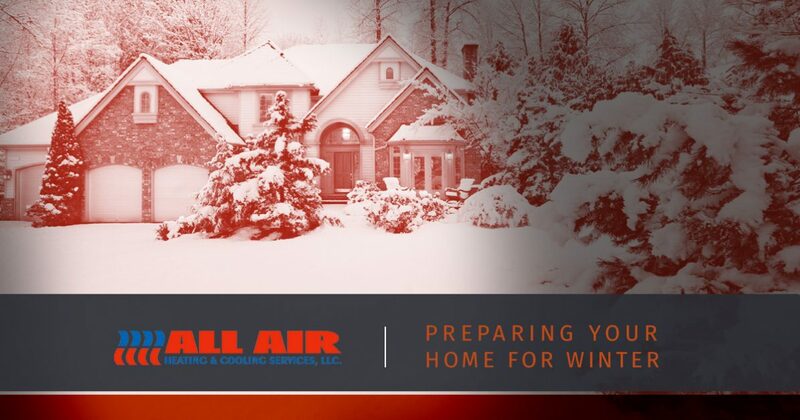 When it comes to your HVAC system and the overall warmth and comfort of your home during the winter, drafts of cold air are your greatest enemy. Leaks and drafts are a two-way street—they simultaneously let cold air in and warm HVAC air out. This causes you to turn up the heat on your thermostat, which will make your system work harder and spike your monthly energy bill as a result. To keep cold air from icing your home and your finances, you’ll need to seal things up and make them more airtight for the winter ahead. Weatherstirpping for the bottoms of your doors (also known as “door sweeps”) will create a tighter seal that keeps air where it should be, and doing some simple hinge adjustments to your doors will make sure that they’re properly aligned and creating openings or seams in your entryways. Finally, special weatherstripping for the bottoms and sides of your windows will make sure that older window models seal tighter and block wintery air from sneaking in. It’s all very affordable—weatherstripping for doors costs $25 at the most, and window weatherstripping is even cheaper. Stop by your local hardware store while it’s still sunny so you don’t have to wear a jacket just to install your weatherstripping! Warm air rises—and if your attic is poorly sealed and insulated, that warm air might just rise out of your home altogether. If you’re not sure what’s going on in your attic in terms of sealing and insulation, it’s time to grab a dust mask and a shop vacuum and get up there to take a look. First, inspection the walls and ceilings of your attics for drafts at seams or exposed vents and pipes. According to HouseLogic, as much as 30 percent of the warm air in your home could be leaking out of these attic areas, so use caulking solution and spray foam insulation to close up these areas. Next, line your attic with some good old R-49 insulation. This type of insulation is normally used for extra-cold climates, but a little extra insulation never hurt anybody. Sometimes, the best thing you can do for energy efficiency in your home is to practice better energy usage strategies. This is easier said than done—after all, it’s tempting to set your heater on “max” until your home heats up. The key to energy efficiency with HVAC units is to run your system only when you need it, and to run it at a temperature that is as close to the outdoor temperature as possible. Fortunately, a programmable thermostat will help you accomplish both of these feats easily. With a programmable thermostat, you’ll be able to schedule temperatures and times for heating in your home, allowing you to turn down the heat (or turn it off) when things heat up in the middle of the day, and turn the heat up when things start to chill out in the evening. There’s no need to crank the heat all day long—set your temp at a modest 68 degrees during the day to keep indoor temps from reaching extremes, and turn it up a few degrees before you leave the office at the end of the day so things are warm and cozy when you get home. If you’re going to save big and stay warm this winter, you need to make sure your home’s HVAC system is ready to go. That’s where All Air can help. Our experienced team can help prepare your HVAC system for the chilly months so you can stay comfortable and have maximum energy savings. Schedule an appointment with us today!